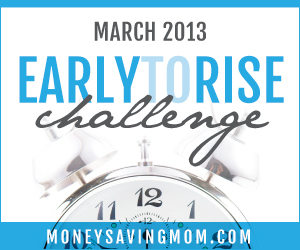 This is Day 22 of Money Saving Mom's Early to Rise Challenge! Today's passage is about asking your spouse to get up early with you. I'm kind of excited for this because I sometimes feel Hubs and I don't get to spend a lot of time together. I know we won't be able to both do this all the time, but it would be great to be able to just once a week or so. Our action tip for the day is to write our spouse an invitation to rise early with us tomorrow morning. I'll be doing that in a minute. Thought I know Hubs doesn't entertain the idea of rising early nearly as well as I do, I think he might just go on this with me, if only for tomorrow. I think I'll make it into a coffee/bible study time for us, so I might not make it back here to blog before Wednesday. I'll let you know how it goes! So, what time did I get up today? Fredrika went off at her normal 5 am, but I didn't get up and about until 5:17 am. I'm pretty sure with tomorrow being a challenge for both me and Hubs, I'll be up on time. Maybe I'll even have pictures of us tomorrow! We found the camera cord! 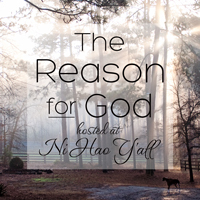 Will you be inviting your spouse to join in with you tomorrow? If not, who do you think you'll invite? We are the Stewart Family! This is our story of life, love, laughter and tears on our journey to bringing our family home! May 2011 - Applicaition Accepted! October 12 - Finally bit the bullet and started home study process! EEKK!! Rare Savings on Burt’s Bees Baby Pajamas, Rompers & More! Where've I been this past week!